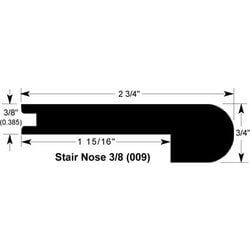 Jasper Engineered Hardwood Moldings - Myth Birch - Venus Venus / Stair Nose / 78" x 2 3/4" x 3/4"
Venus / Stair Nose / 78" x 2 3/4" x 3/4"
78" x 2" x 3/8"
78" x 2 1/8" x 3/4"
48" x 2 3/4" x 3/4"
78" x 2 3/4" x 3/4"
94" x 2 3/4" x 3/4"
78" x 1 1/2" x 3/8"
78" x 2" x 13/16"
94" x 2" x 13/16"
78" x 1 1/5" x 5/8"
94" x 1/2" x 6"
94" x 3/4" x 4"
94" x 3/4" x 6"
Had one piece that was not to specs and I had to run it through the table saw and shave a little bit but other than that it was a very nice product. Used it for a border. Buying more for the stairs. Looked great on the edges of our staircase.